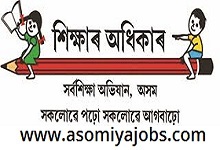 Samagra Siksha Abhijan invited eligible and interested candidates to fill the below mentioned position under Samagra Siksha Abhijan on Contractual Basis. The post is temporary in nature and the selected candidate will be initially engaged for a period of 11 (eleven) months only. The contractual engagement will neither be regularized under SSA nor will be absorbed under any job/programme of Government of Assam in future. 4. 10 years of experience as Instructor of BTC/Normal School, Higher Secondary level.